Our VOX trip to Uganda was September 2015. We built 2 structures for a sustainable farm to help the locals provide a way out of a difficult situation. We were focused on teaching battered women lucrative crafts like sewing and cooking to support themselves and others, young men to learn construction and a safe haven for 250 orphans. My write up from 2015 below. My recent excursion to Africa was life changing. It’s hard to comprehend living in an environment 2 kilometers from the equator with no electricity, no running water, no refrigerators, no ice and no shoes. 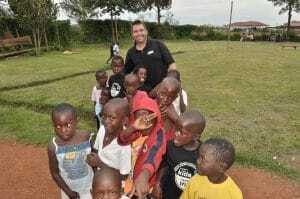 We spent our time in the small village of Ngambe, Uganda. 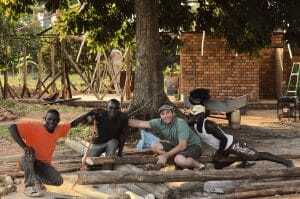 I was blessed with the privilege of leading a team of 4 Americans and 4 Ugandans to build a farm house 25ft x 125ft. The house will eventually be a home for 4 workers and their farm equipment. Ugandans eat beans, rice, matoke and pashoo (both starch staples) almost every meal. Such an amazing group of people despite their circumstances… loving, happy and kind. Be encouraged to get out there and volunteer your time and make a difference. Every day on this earth is a gift. The beauty of life is finding ways to help others. VOX employees can make a positive impact when and wherever we choose.